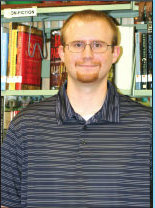 With the recent hiring of Glenn Kahmann as director, a new chapter has been written in the history of Estill County Public Library. Although only 24, the native of Walton in Boone County has gained valuable experience through education and on-the-job training. Becoming a librarian wasn’t something the youngest of three brothers set out to do after graduating from Walton-Verona High School. Initial thoughts were to become a history teacher, but that plan became history while earning an undergrad degree at Eastern Kentucky University. A discussion with his advisors led to pursuit of a Master of Science degree in Library Science from the University of Kentucky. While attending UK, he worked as a page, shelving books at the Lexington Public Library. He has also worked on the reference desk at the Campbell County Public Library, and on the reference desk at EKU as a graduate assistant. It was while at EKU that the Richmond resident was handed a fax regarding the opening at Estill. A replacement was being sought for Liz Williamson, a long-time teacher and librarian in the community. “I got pumped up about this job as soon as I read the fax,” says Kahmann. He was already familiar with the area, having visited here with fraternity brothers to shoot clay pigeons. What changes can library patrons expect from the new director? Updating the computers and expanding the DVD collection are top priorities. “We’re hoping for a Library Services Technology grant for the computers,” he says. The science fiction fan, who counts the Dragon Lance Fantasy Series among his favorite books, is also looking to get more science fiction and fantasy books in the library. A long-time book collector, the soft-spoken 6 ‘2” says he preferred reading over sports while growing up in northern Kentucky. “I wasn’t much into sports, so I read a lot, but I did run track one year,” he says. Despite the popularity of computers, the new head librarian sees no danger of books becoming obsolete anytime soon. “Computers are fine, but most people are more comfortable having a book in their hands,” he notes.